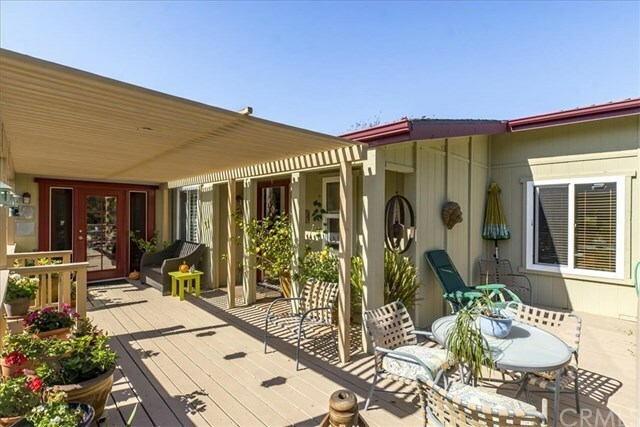 Come home to your own zen retreat in Avila Beach. You own the land in the 55+ Indian Hills community behind the gates in San Luis Bay Estates, and this property includes a private garden with shade trees, footpath, drought-tolerant plants and fruit trees. The 1700-sq-ft, 2 bedroom, 2 bath home has been lovingly maintained, including beautiful remodels to the kitchen and baths. The open-concept floor plan is complemented by a dining area with built-in curio cabinet, spacious living room with fireplace, an intimate seating area for reading or visiting, dual-pane windows, plantation shutters and welcoming front door with side lights. The living room could be partitioned or walled off to create an office or bedroom with private entrance. The oversized en suite master features a fireplace; two large closets; room for a couch, dressing area or gym equipment; and an exterior door that leads down a side path to an enclosed 2-car garage with cabinets and extra storage area. A laundry room off the kitchen allows function with separation. Four entrances allow for natural cross-breezes and indoor/outdoor living. The warp-around deck framing is well-constructed, built with pressure-treated wood. The HOA includes access to the pool, sauna and community building. Appliances included. Eligible for VA and FHA loans, with certification. Inclusions: All appliances. Furniture may be for sale.